I put together a 16-panel comic to print out for my cubicle wall at work. 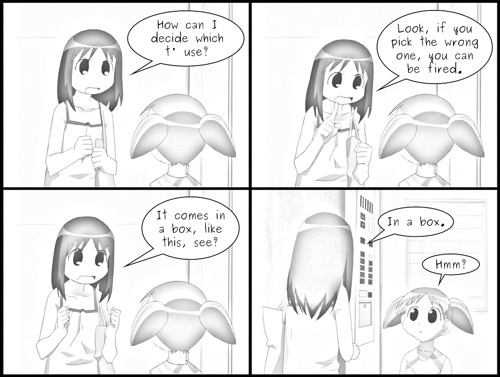 I realized it can easily be split into four four-panel comics. They each stand up on their own, excepting that you need to read them in order for the later ones to make sense (as they build on one another). 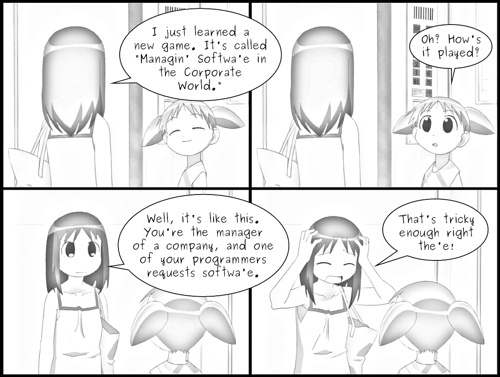 Ayumu’s having trouble grasping even the a simple concept a manager has to deal with… My manager does much better with all the software requests I have that would make life easier. One of these days I’ll finally have software revision control, I’m certain of it. Maybe in five to 15 years. 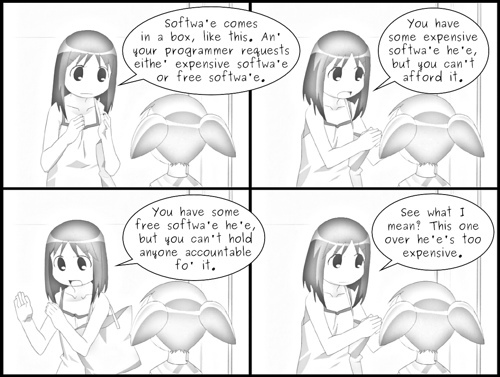 I didn’t intend for it to be this way, but it looks like Ayumu’s having trouble understanding accountability in case of software problems, so she goes back to what she can understand: something being too expensive. 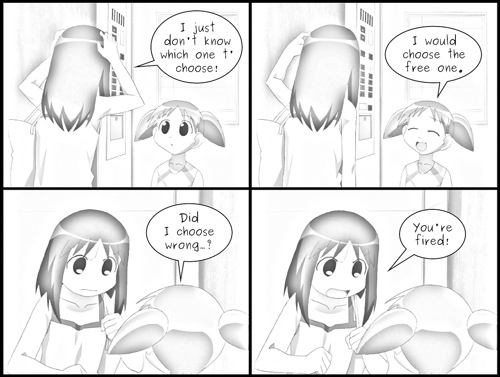 Although I didn’t plan it this way, it seems this is much too complex for Ayumu, so she returns to the easiest part of it. The box. Hopefully a few people enjoyed this four-part series as much as I do. Knowing Ayumu’s personality probably makes this at least twice as funny. Having tried to get software approved at work falls in line with what I think Scott Adams (of Dilbert fame) has said about his comics being funny because they’re something people in the office can relate to. If he didn’t say it, well, it’s true nonetheless.